People have the power to drive communities. At Maritz, we focus our community involvement and corporate responsibility initiatives on educational endeavors. We see education as a powerful way to help children and adults reach their full potential, and in turn, help a community reach its full potential as well. 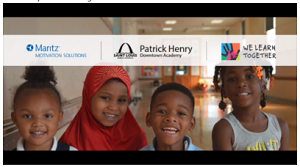 For the past two years, Maritz has partnered with Patrick Henry Downtown Academy, a local St. Louis City elementary school. Our friends in Maritz Motivation Solutions recently published a blog highlighting the success of our partnership with Patrick Henry and the impact our work together is having on students’ lives. Check out the blog post and video. It’s a story you don’t want to miss.